“I think I’m more nervous than the students,” says Kelly Ashby, Grade 2 French Immersion teacher at Caledonia Centennial Public School, in her perfectly arranged classroom. Is she nervous because Director of Education Brenda Blancher is standing in front of her desk on the first day of school? She shouldn’t be worried; Blancher is on the Great Grand Erie Road Trip, and starting the day in Caledonia is a bit of a homecoming. She was Superintendent for Haldimand Country in 2011 when the French Immersion program was first introduced. Caledonia Centennial Public School was one of three elementary schools outside of Brantford to first offer French Immersion. The growth of the French Immersion program mirrors the growth at Caledonia Centennial more generally; the school was under construction this summer, adding new portables to accommodate an increase in enrolment, and exterior updates to the façade of the 1967 building. Outside in the school yard, Principal David Gervais is hard to miss. He and several members of the staff are donning brightly coloured vests as they greet students and families. 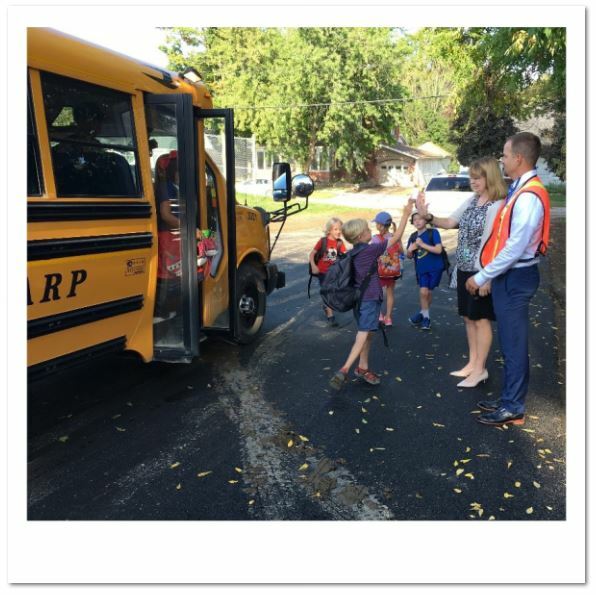 New paths are in place from the parking lot and as students begin to arrive, the brightly coloured vests assist them as they locate their teachers to start the first day of the 2018-19 year. With a final busload of students arriving, everyone is ready to have a bonne journée. For Director Blancher, it’s time to hit the road. Across the Grand River, and into Norfolk County, Blancher arrives at Bloomsburg Public School, and thinks she may have found one of the best spots in Grand Erie to relax. She’s ready to keep the secret to herself – who couldn’t use a nap between meetings at the Norfolk School Support Centre? – when Principal Lori Rodgers interrupts. 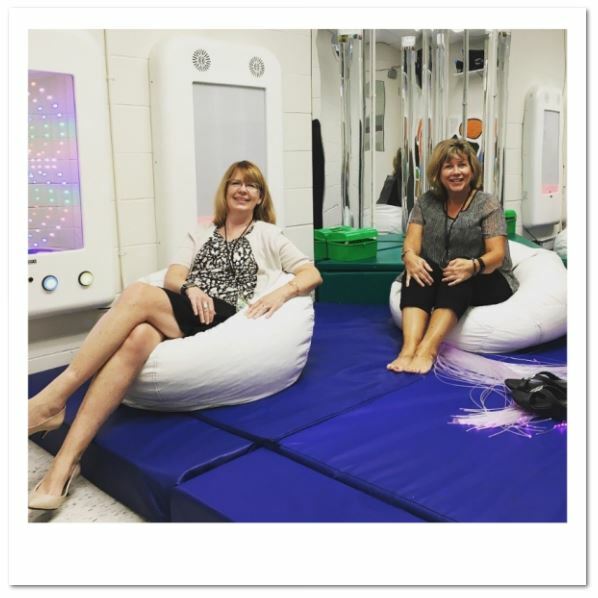 “Welcome to our new Snoezelen Room,” announces Principal Rodgers of the multi-sensory environment, developed thanks in part to community donations. Snoezelen Rooms are relaxing spaces that help reduce anxiety, and also stimulate reactions and encourage communication. “This space will be used a lot by our Autism class students, but is open to any students,” says Rodgers. The new room is connected to the Special Education classrooms at Bloomsburg Public School, which are well designed, multi-faceted spaces, incorporating areas for group activities as well as quiet spaces. Director Blancher thinks she could sit in the Snoezelen Room’s bean bag chair all morning, but down the hall, Principal Rodgers is welcoming students to an opening assembly. Kindness is the word of the day at this assembly, setting the tone for the school year. Principal Rodgers points out some changes to the school grounds returning students may have noticed – namely, the removal of two old trees – which will make way for a kindness garden. Stay tuned as the project takes shape this year. A now well-rested Director Blancher decides to go in search of arts and culture next, so it’s down the road to Teeterville Public School. Walking into the school, she’s greeted by a stunning mosaic depicting the face of a tiger, the school’s mascot. “This mural was a long time in the works, but I just had to show up and unveil it,” jokes Principal Ian Summers. Principals have “first days,” too, and this is Summers’ first September at Teeterville. The work of art in the entry is testament to that, and a mosaic a fitting metaphor for the school community. Local artist Suzanne Coverett Earls dedicated her time and expertise to provide students with a hands-on lesson in mosaics, and then brought the pieces together for the final installation. “Everybody contributed a small part which all came together to form something beautiful,” notes Summers. This culture stop on the Grand Erie road trip is a must-visit to marvel at the mural in person. Be sure to include it in your plans this year. 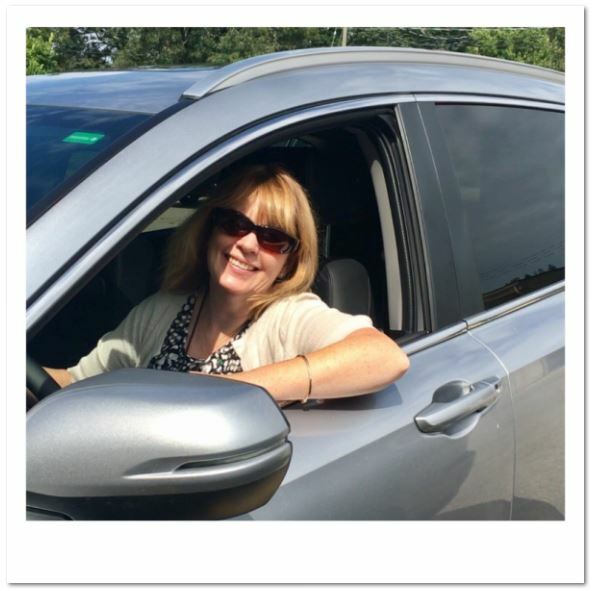 Director Blancher is on the road again, and this time, she’s heading north into Brant County, to Paris District High School. She’s greeted by the administration team of Principal Laurie Tottle and new-to-the-school Vice-Principal Jim Merrick. In the cafeteria, Grade 12 students are eating lunch with Grade 9 students as part of the CISS initiative – Caring Independent Senior Students – a program that partners student leaders with those that are new to the secondary school experience, to help ease the transition. The building is filled with a friendly energy as Grade 9 students complete their first first day of secondary school, and Grade 12s experience their last first day. At her last stop on the Great Grand Erie Road Trip, Director Blancher is joined by Superintendent Denise Martins and Indigenous Education Lead Sabrina Sawyer to learn more about the Good Way Club, which began at Lansdowne-Costain Public School last year with the goal of fostering pride, leadership, and community among Indigenous and non-Indigenous students. “The Good Way Club allows students to be active in Reconciliation, and is a great place to begin to do that work,” explains Sawyer of the club which builds networks that empowers students to share their learnings both in and out of the classroom. 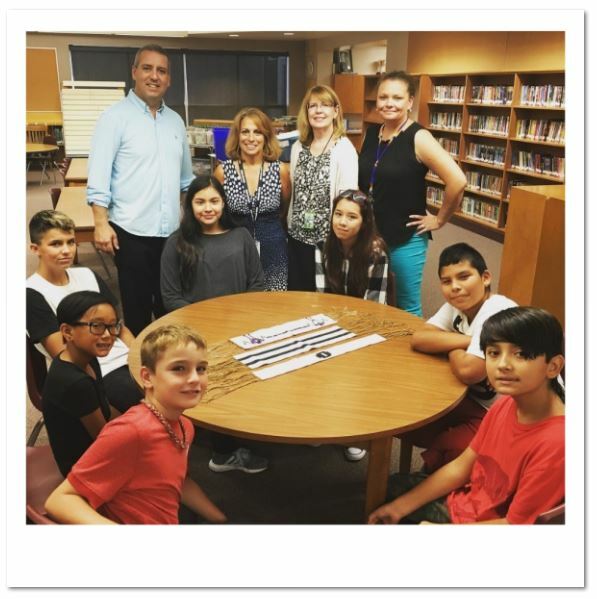 In the library, members of the club explain the significance of the Two Row wampum, a symbolic record of the first agreement between First Nations and European settlers on Turtle Island/North America, and the basis of subsequent treaties declaring a peaceful coexistence. “It’s a way to show a treaty between the people to say that they will share the land, and not interfere with each other’s ways of doing things,” says Jasmine, a student and member of the Good Way Club, as she shows off the intricate bead work of the wampum. Principal Darryl Casey, a principal in a new place this year, is excited to support the club as it continues this year. His transition from Prince Charles Public School has been positive, thanks to the fantastic support staff that are part of his new team. Daytime Custodian John Anderson spent the summer getting the school ready, including a fresh coat of paint. The support team also includes secretary Wendy Wardle, who has been with the school for 13 years. With the wisdom of experience working in her favour, she’s had a very smooth first day, and is excited for the year to come. “I’ve gotten to know all the students and families really well over the years,” she says. Lansdowne-Costain Public School, like schools across Grand Erie, counts its Educational Assistants as crucial members of its team as well. In a Grade 1 classroom, Blancher meets Marnie Murray, who is working with her student to help bridge the transition from Kindergarten. As Director Blancher wraps up her epic road trip, one thing is clear. Here’s to a wonderful 2018-19 year!